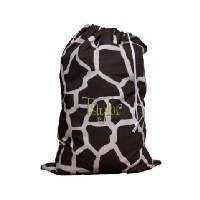 Zany and wild, this Laundry Bag by Rub a Dub Dub in Giraffe, is sure to make a statement! Designed with a drawstring closure, your laundry stays safely contained whether you are going to the laundromat or the laundry room. Boasting a bold chocolate brown giraffe animal print, this laundry tote is chic and eye-catching. Elegant embroidery adds that extra special touch. The letter style and positioning is as shown in the picture.